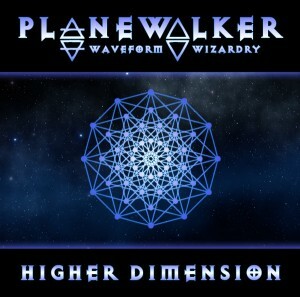 Higher Dimension is progressive release from veteran U.S. psytrance artist and Waveguild Records founder Planewalker. Each track was originally released as a single on Beatport, and all of them charted in the Beatport Top 100, garnering critical acclaim from trance DJs across the planet. Slowing down from his usual full-on tempo to a sweet and smooth series of extended mixes in the 130s, this mind-blowing trio of tracks evokes visions of desert landscapes, UFOs, and lasers with the top-notch production Planewalker is known for. The release begins with Digital Dreams, a chunky set-starter with spoken word poetry samples and soaring melodies that glide like birds of prey over a hard-hitting bass line landscape. Next up is Ending The Dreamspell, a groundbreaking blend of bass music, trance, and glitch-hop with a positively wacky breakdown. Finally, the story ends with Higher Dimension, a track that tips its hat to the emerging German minimal style. Chopping up vocal samples of his own voice and other voices as well as tons of tiny, split-second sounds with meticulous micro-editing, this track has a unique and different sound and promises a new direction for the world’s favorite disco wizard. MP3 Download | FLAC Download | WAV Download · Download count: 4,750. Finally! Planewalker released a new ep. going straight to listen to it. Thanks! This is fantastic, production much cleaner and bigger than before and your ideas were always fantastic and inventive. I like the font on the cover myself, reminds me of old adventure games.